I described the last movie I reviewed, Wonder, as gentle. Three Billboards is anything but gentle. It’s a quite intense movie focusing on Mildred Hayes (Frances McDormand), a woman wanting to know who raped and murdered her daughter. 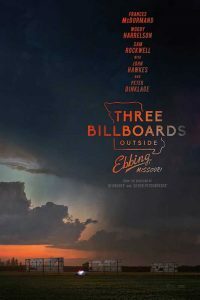 As the movie opens, Mildred rents three billboards on a road outside of Ebbing, the small town where she lives, to ask why no one has been arrested for her daughter’s murder. Full of anger, Mildred demands action. The billboards put the question to Sherriff William Willoughby (Woody Harrelson). The billboards cause quite a commotion among the townspeople. Many of them are upset that the billboards implicate the well-liked Sheriff Willoughby. It’s an open secret in the town that Willoughby has terminal cancer, and many citizens want Mildred to back off. Mildred will not budge. She wants to hold Willoughby and the police department to act. The parish priest comes to visit Mildred, and, in a great example of how not to make a pastoral call, suggests that if Mildred came to church more often, she would be more sympathetic to Willoughby’s plight. In no uncertain terms, Mildred tells the priest to get out of her house! The Sheriff comes to see Mildred and explain that he’s done all he can in the case. The fact that there are no suspects is not for lack of trying. He also tells Mildred about his cancer, which she already knows. Mildred is not unsympathetic to Willoughby’s illness; but she is unrelenting in her quest for answers. Officer Dixon (Sam Rockwell) one of the town policemen, also becomes involved in the case. Unlike the Sheriff, Dixon shows little empathy for Mildred. Dixon is not the smartest guy in town. He lives with his chain-smoking mother. Furthermore, Dixon is a racist, and prone to violence. English playwright turned movie writer/director Martin McDonagh weaves this story of crime and violence in small town rural America in unexpected ways, fleshing out these three main characters and many others. This is a very well written movie, taking the viewer in unexpected places. McDonagh finds the humanity in each character in amazing ways. Three Billboards deals with raw emotions. I warn you that there is rough language throughout, as well as violence along the way. McDonagh’s screenplay also employs very dark humor. It’s edgy and often caught me off guard. You think you know where the movie is headed, then, like a country road, it takes an unexpected turn. I don’t want to do a spoiler alert. However, I will say that an important character dies halfway through the movie, leaving beautifully written letters to several other characters. It’s a stretch, I know, but the letters are almost epistles, in their beauty and their ability to cause a change of heart in characters. I would love to have a copy of the screenplay if for no other reason than to read these letters. Despite the dark, violent world of Ebbing, Missouri, the letters become a catalyst for unexpected reconciliation and hope. In one brief but moving scene, two men find themselves sharing a hospital room. One was injured when he was thrown out of a window. He realizes that his roommate, suffering from burn wounds, was the man who caused his injuries. Rather than attack this man physically or verbally, he brings him a glass of water, as a sign of healing. McDormand, Harrelson, and Rockwell give excellent performances. They are already receiving recognition for their performances. McDonagh also deserves recognition for his intense, suspenseful direction and excellent screenplay. I like Three Billboards very much because it dares to take on issues of violence (especially against women) and race. As we know, these are issues which plague our country. Yet McDonagh doesn’t exploit these issues. Amazingly, he lets us know that, despite everything, reconciliation is possible. Conversion is possible. One of the characters has a kind of dying and rising that caught me off guard. I haven’t stopped thinking about Three Billboards Outside Ebbing, Missouri, since I saw it a few days ago. Because of the language and violence, it may not be for everyone. But if you see it, I think it will stay with you for a long time too.